A search for knowledge about the civil war in the COURTOIS HILLS. One of the most controversial figures intimately involved in the our local area of study was William T. Leeper. In this post I will introduce a portion of the records that I have compiled. I wish to take a little time to look at the documents we displayed in the previous post. The first is dated November 16, 1861. In order to gain a much more perfect understanding about what had transpired here in Missouri, up until November 16, 1861, I refer you to the timeline found here: Civil War St. Louis go down to May 10, 1861. Please take your time and thoroughly explore this wonderful resource. I could only wish to be able to explain as well what was happening here at that time as these good folks have done. You now have read more about the early days of this great conflict and the lead up to warfare in Missouri than the majority of your peers. I'm sure that you now understand a little more clearly why Capt. Hawkins and Mr. Leeper were supposedly on a mission of peace to attempt to calm the nerves of the residents of SE Missouri. Capt. H. P. Hawkins was a merchant at Patterson and at the very commencement raised an independent company of cavalry for the federal cause. Mr. Leeper was a land speculator, businessman, lawyer and politician from the Big Brushy Creek area of Wayne County very near the border with Carter County. Although attempting to raise his own company for the federal service, Mr. Leeper had not the political backing at this time to make such a thing happen, though he soon would. I am exceedingly anxious to have Capt. Wm. 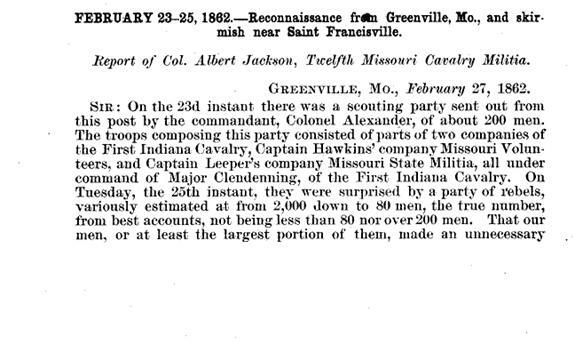 T. Leeper with his co. attached temporarily to my regiment. A small battery of Enfield Rifles guns has been attached to my Regiment and having been much with Capt. Leeper and highly appreciating as I do himself and his command I should be very glad to have his company as a support to the battery. Their Enfield Rifles would make them a most efficient support. If you could spare Capt. L. and his Co I would be much gratified. If you cannot grant any request I hope you will allow me to commend Capt. L as worthy of your confidence. I have been much with him and have witnessed his conduct under varied circumstances and know that he is wise in command and brave in danger. I quote; "A small battery of Enfield Rifles guns has been attached to my Regiment and having been much with Capt. Leeper and highly appreciating as I do himself and his command I should be very glad to have his company as a support to the battery." Losing those new rifles had to hurt! *"Leeper's brother" probably referring to George W Leeper. 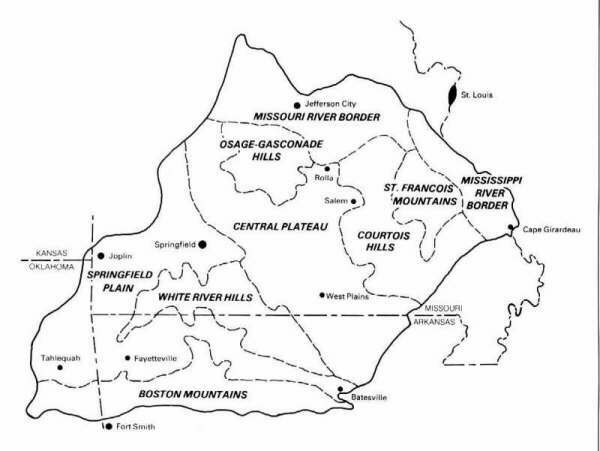 *James M L Jamison taught the school on Mahan's Creek in Shannon County, MO before the commencement of outright war. Sixty-nine years ago last week (last week of August 1862), the people of Shannon County were thrown into grief over the murder of John West, Mrs. Sam West, Louis Conway, James Henry Gaylon, William Chilton, Henry Smith, Sam Herring, Jack Herring, John Huddleston, John Story and Joshua Chilton. The tragedy was one of the bloody incidents of the Civil War days and was instance of what man will do when war uncovers the brutal in man. As the story is told, by relatives of the victims, John Worthington became an enemy to Joshua Chilton over an imaginary wrong, and Dave Smith became an enemy to Alexander Chilton over a real wrong. So, they managed to get a company of Federal soldiers to come over from Rolla to the vicinity where the Chilton’s lived and the drive on the various homes was made in the dead of the night. They first caught John Huddleston, then Jack and Sam Herring and William Chilton. The band next approached the home of A.J. (Andrew Jackson) Chilton who heard them coming in time to leap out of a window in his night clothes, and by joining a heard of sheep in the pasture he escaped by running off with them on all fours. He thought to run to the West’s home which was nearby, and warn him, but the raiders beat him there, passing close to him. He saved himself from detection by hugging closely to the opposite side of a tree as they passed him. When the raiding party reached the West home, Sam West, whom they were seeking, crawled under a bed and some reason they did not search the house. John West, Sam’s father, stood on the porch and talked to them until they turned away. Then Sam came to the door and fired a double-barreled shotgun at them, but missed. The raiders fired back at old man West killing him instantly. Mrs. West thrust Sam back into the house and, as she came between him and the enemy they fired a charge of heavy shot into her back and hips, from which she died about two weeks later. Next, they caught Alexander Chilton then reached the home of Joshua Chilton while the family was a breakfast. Mr. Chilton and Louis Conway  ran from the house and hid among some weeds in the yard of an old house about a half a mile away. The, the soldiers spied Conway and killed him. Mr. Chilton slipped away and would have escaped if he had not been discovered by one of the enemy who had wandered away from the rest of the party. James H. Gaylon had a leg broken some months before this event and, as the prisoners had to walk, he leg became sore on the first day’s travel and he realized he would not be able to travel the next day. That night, the prisoners were placed in a vacant house with two doors. One guard was placed at one door and two guards were placed at the other. One of the two guards went to sleep and James H. Gaylon whispered to Alexander Chilton to knock him down with his boot and he would hold him until the prisoners could escape. So, Chilton passed the word on to all the others so they would be ready. But, Joshua Chilton, was a Free Mason and he whispered to the others not to attempt to escape, saying that as two of the enemy were Masons he thought that through their influence he could save the lives of all the prisoners. Next morning, when ready to start, J.H. Gaylon told the guard that he could not walk any further and, they told him he must go on or they would kill him. He sat down against a tree, brushed his hair back and said, “Kill and be damned”. They shot him in the forehead. Alexander said that it was then that Joshua Chilton realized the mistake of objecting to them making an attempt to escape the night before. The guards in charge of Henry Smith and William Chilton lagged behind just until they were out of view of the rest then shot both prisoners. Then, they caught up with the others and proposed that they kill them all. This, the guards agreed to do. They ordered the prisoners to take off their shoes. Joshua Chilton appealed to the two Masons and asked them, “Are you going to shoot me down like a brute?” They answered, “You can’t tell any difference.” Mr. Chilton said to them, “I have friends that can walk as deep in blood as any of you.” They were shot down and left lying in the road, all but Alexander Chilton, who, seeing their intention, dodged into a jungle of thick brush and escaped. They shot at him as long as they saw the brush shake, and then gave chase, but he ran through the jungle until he found a stock path, turned at a right angle and followed the path for a distance, then turned again at a right angle and crossed the road at the scene of the murder. He ran on about a mile and came to a spring where a young woman was washing clothes, and, being thirsty and exhausted, he drank and lay down to rest. The woman threw some unwashed clothes over him and in a few minutes the enemy came along and asked here if she saw him pass. She pointed in the opposite direction from Chilton, indicating that he had passed in that direction. When they had gone Chilton took to the woods again, traveling only by night and arriving home after eight days. During that time he had nothing to eat but apples. The raiders had not taken his weapons, so when he had rested up a bit, he got Charles T. Chilton and Jack Smith, brother of Henry Smith, one of the murdered men, to go with him to settle the score with John Worthington, one of the instigators of the crime. The three went to his home in the vicinity of Round Springs, in the night, same as the enemy had come to Chilton’s in the night. Worthington resisted but was wounded. His wife assisted him onto a bed and both began to beg, but they finished him after reminding him that their people did not beg when he and his gang of murderers shot them. Dave Smith fled to Rockford, Illinois and was running a ferryboat there when Chilton located him. He disguised himself and went on the boat intending to attend to him on the other side; but Smith recognized him as he left the boat and escaped. But, it was for a time only, for Chilton finally located him in Central Texas and told Mrs. Joshua Chilton, the only person he was ever known to speak to about it, that the last time he saw Dave Smith he was lying near the door of a saloon with a bucket hole in his head and two in his breast. Capt. Bradway Commanding Co E 3d MO Cavalry is hereby directed to detail 50 men and one Command Officer to proceed tomorrow with daybreak in a southern direction to the valley of the Current River and of Jack’s Fork to carry out as far as possible the following instructions. The first object of the expedition is to surprise partisan settlements where it is supposed that members of Coleman’s Command are hiding. Two faithful guides will be added to the Command to prevent that previous information may reach the Rebels the Command will leave the post in another than the finally intended direction and take to the woods when advised by the guides. Armed men have not to be made prisoners but to be shot on the spot every man in whose possession is found property. Horses etc. Should be found, has to be arrested and sending them to be tried by the Provost Marshall. All suspicious Houses have to be thoroughly searched for weapons of any kind. And such weapons to be confiscated buildings known to be harboring places for Rebels have to be destroyed the furniture being removed previously if possible. The 2nd object is to confiscate from secessionists and rebel sympathizers, such property as May be turned over to the use of the U.S. as Cattle Forage Horses etc. if it is possible wheat will be thrashed and ground at the nearest mill. Transportation has to be furnished by rebel sympathizers. it is sufficient to leave a family one milk cow so much provision as is necessary for their support through the year. 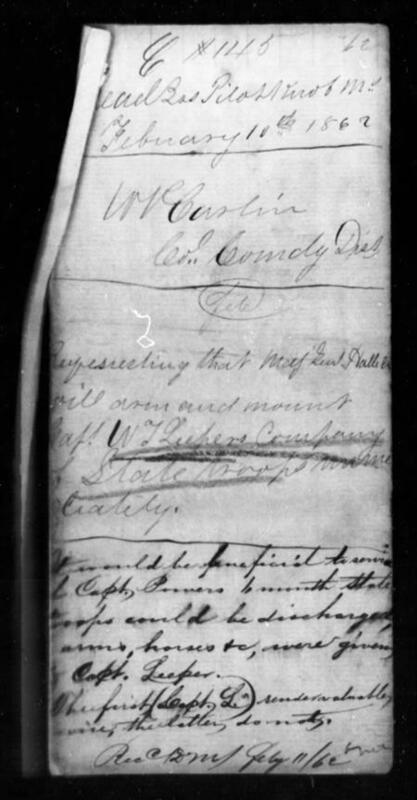 Of all confiscated property a correct list has to be kept by the Commanding Officer to be delivered to the Provo Marshall of this Post after return, The Command will provide themselves with five days rations of Sugar and salt. All other subsistence has to be drawn through the country. They will return as soon or before the before mentioned objects are accomplished as far as it is in their power not before. Scout from Salem to Current River, Mo. Report of Lieut. Herbert Reed, Third Missouri Cavalry. Fifty men in the command. Marched in a southerly direction until noon, then halted for feed and dinner 20 miles from Salem, on the Barren Fork of Sinking Creek. Marched down Sinking Creek in a southwestern direction 5 miles; then changed course to the south and marched 6 miles, which brought us to the Current River, and continued 4 miles down Current River in a southeastern direction and halted for supper. At 11 p. m. resumed the march in a southern direction 6 miles on the country road, and halted at the house of a certain Jackson Sugs. Searched the house, but found nothing. Resumed the march in the same direction for 4 miles, and halted at Chilton’s Mill. Searched one house; found no man or contraband goods. Searched the house of one Andrew Chilton. In doing so was fired upon by some persons inside. The fire was returned, killing 1 man, supposed to have been wounded; also wounding a woman (who was standing near the men) slightly. Names unknown. No contraband goods were found in the house. Resumed the march in a westerly direction 2 miles, and sur- rounded the house of one Cedrick(Shadrach) Chilton. Searched and found 3 men, Alexander Chilton, Henry Smith, James Gallien. and shortly after William Chilton; also 1 gun, 1 United States saddle, 2 United States horses, and 2 contraband horses, all which I placed under guard. Resumed the march. Halted at the house of one Joshua Chilton. Three men ran from the house and were fired at. One (Jesse Conaway) was mortally wounded. One (Perry Chilton) was shot at as he was going into the brush. The result is unknown. All of them were previous to the fire commanded to halt. Joshua Chilton was caught, after a pursuit of nearly a mile, swimming through Jacks Fork. Also found 2 United States mules, a sorrel mare (claimed by our guide, David B. Smith), and one contraband horse (white stallion). The property was placed under guard. We now unsaddled for feed at 8 p.m. August 25. After resting for two hours marched in a northerly direction 15 miles (found no rebel or contraband goods on the march), which brought us to the residence of D. B. Smith, our guide. Here we encamped for the night. On the 26th left a part of the men to guard the prisoners. Marched the remainder 20 miles northeast to Big Creek. Searched a number of houses on the route. At that of Andrew Marsh found but 1 estray horse in the woods. (Marsh is said to be with Coleman’s band.) A bay mare found in the pasture of Daniel Williams, said by his wife to be estray; 1 bay mare found with Benjamin Conway, contraband, and a bay mare and horse found secreted in the woods at Jackson Herrings. Took man and horses along. Confiscated several horses and colts at the house of one Goforth, whose son is with Coleman. Goforth ran and escaped. Returned to the camp on Current River. On the march, from the time we left Salem until we returned, whenever we saw a man run and leave a horse we took the same, leaving word for them to prove themselves loyal and take their property, if they wished. On the morning of the 27th we procured a wagon and oxen of Alfred Deathridge, for transportation of the families of David and Dan Smith, and took our march for headquarters at Salem. Reached the residence of Joseph Conway, where we encamped for the night. August 28, at 5 o’clock, reported at Salem. Delivered prisoners and contraband property. 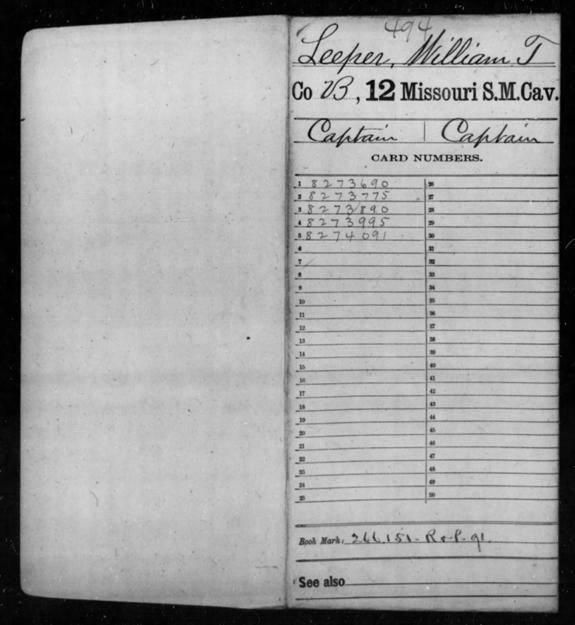 Second Lieutenant Company B, Third Missouri Cavalry. I hereby send to you by Capt. 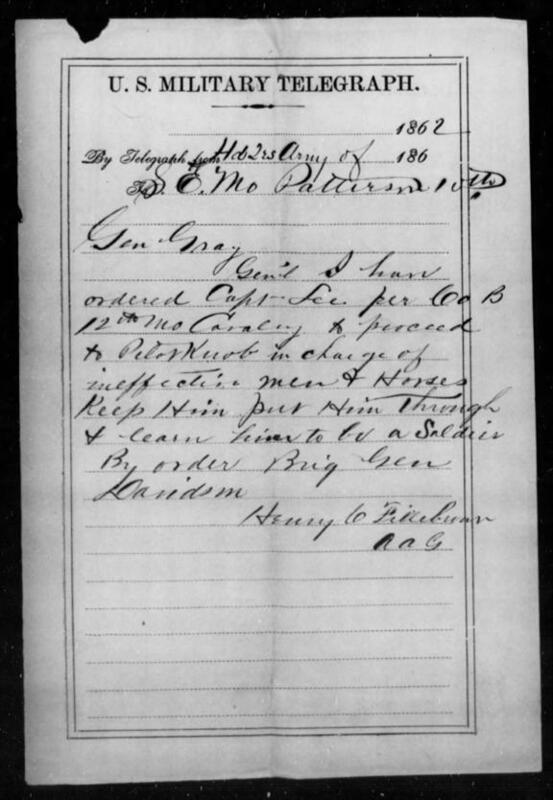 Avery, 3rd MO Cavalry, six prisoners taken by a detachment of Comp. E, 3rd MO Cavalry under command Lieut. Reed, in Shannon County, MO. I have had not time enough to procure all the evidence in their cases but I will be able to do so by next week when I will forward them to you. The following is a list of them. Joshua Chilton, Alexander Chilton, Henry Smith, James Gallian, William Chilton, and Heron. Joshua Chilton has been a State Senator, and is a very Dangerous rebel, and the troops have up to this time never been able to capture him, though often attempted. Alexander Chilton, Henry Smith and James Gallian are rebels of the deepest dye, murderers and horse thieves. The last two are rebels but are of a less desperate character. I am awaiting the arrival of two witnesses in their cases, to draw up regular charges. I sent requisition for stationary a short time since, but have not yet received any, by attending to it you will very much oblige me, as I have none on hand. Henry Duncker, Capt. 2nd MO Cav. Col. J. M. GLOVER, Commanding Rolla Division. COLONEL: Your favor of the 28th came to hand last night, also pay-rolls to be substituted for muster-rolls. Hospital payrolls are yet missing. Please send them by returning express. Lieut. H. Reed returned yesterday with his detachment after a very successful expedition down the Currant River to Jacks Fork. He secured some of the worst and most dangerous characters in the whole district, among them the late State Senator Joshua Chilton, the King of Shannon County, as they call him, who did more to induce men to join the Southern Army than perhaps any other man in this whole State. The number of prisoners Lieutenant Reed brought in is six. I will deliver them tomorrow to the detachment of cavalry returning to Rolla. A good many contrabands and some U. S. horses were brought in also. Three men who were met in arms and one who tried to run away when ordered to halt were killed. Of all those proceedings I will give you further details in my next letter. The country over which we traveled, the report winds up, was very destitute of water until we reached Sinking Creek; after that it was rough and hilly and supplied with an abundance of the purest of water, plenty of corn in the field, in the valleys some considerable fruit peaches and apples not very many sheep, an abundance of cattle, not much small grain that I saw; found two grist-mills and any quantity of hogs, though they are all poor. According to the reports of Lieutenant Reed as well as of the guide it will be easy to secure from the Currant River Valley alone 1,000 head of good cattle if only a force of about 300 cavalry be employed to make a clean sweep through it. To take a part of the cattle at a time would have the effect to drive the balance into the woods. The news our guide could collect of the whereabouts of Coleman differ in so far that according to one (secesh) report he was cashiered and superseded by a certain Captain White, who was last year connected with Jeff. Thompson; that according to the other one he is at or near Batesville, on the south [north] side of the White River. A Union man who was a prisoner with Coleman when it became known that Colonel Boyd was after him said that Coleman went then through the different camps addressing his men in such a way as to impress upon them that every one had to take care of himself; as they were pursued by the enemy and every one only provided with two rounds of ammunition. He is now reported 2,500 strong, but can according to the best calculations have no more than 1,500 to 1,800, of whom only 400 armed and provided with two rounds each. Certain it is that no hostile force of any considerable strength is to be found within sixty miles of this post at present. I was therefore very much surprised by the sudden appearance of a cavalry detachment which you were kind enough to send me as a re-enforcement. As this post is in no way endangered now I told Captain Avery that he might return to-morrow at his best convenience. I have never received the order of the War Department regarding the destruction of buildings. It was not my intention to have other buildings destroyed [than those] which are of real advantage to the enemy, and have been and will be used as places of defense and shelter. J. WEYDEMEYER, Lieutenant- Colonel, Commanding Post. Henry Duncker, Capt. 2nd MO Arty. COLONEL: Referring to my communication of yesterday I send enclosed copy of Lieut. Herbert Reeds report. * (Series 1 - Volume 13, Pages 260-261) The prisoners were delivered this forenoon to Captain Avery for transportation to Rolla, but soon after they had started report came in that one of them, James Gallian, when about a mile distant from town had tried to run and was shot dead. I ordered the officer of the day to take a couple of men with pickaxes and spades to the spot to bury the man and ascertain the facts as far as possible. Very soon after that Lieutenant Lacy came in and reported that about one mile and a half farther the balance of the prisoners had found their end in the same way. I went out myself immediately. Gallian was buried already on the spot where he was found, some twenty-five or thirty yards to the right of the road, shot through the head. One mile and a half farther I found also to the right of the road about thirty yards distant two of the dead prisoners near together; then about sixty yards distant in the same direction a third one, and last about 200 yards distant in an opening of the woods the former senator and judge, Joshua Chilton. The three mentioned before were Alexander Chilton, William Chilton and Henry Smith. Jackson Heron, the sixth prisoner, very likely escaped. We could at least find his body nowhere, and a farmer living in the neighborhood had seen a man run past his house about the same time the shots were fired. The examination of the ground convinced me that the dead were lying on the same places where they were killed, a small pool of blood under them, no other traces near, evidence enough that they had not been dragged from one place to another. In regard to the characters of the prisoners I wrote you already and nobody doubts that they fully deserved their fate. I have to say nothing more about Joshua Chilton, the senator. In the possession of Alexander Chilton a Government saddle and two Government horses were found. He was known as [a] waylayer; assisted in robbing trains, killing stragglers and continued this trade with more eagerness since he took the oath of allegiance to the United States. William Chilton served in Prices army and continued to be a rebel afterwards; never took the oath. Henry Smith, one of the most desperate characters, was accused of the murder of Worthington, was a worthy member of Coleman’s band and robbed twice the store of William Copeland in Barnesville, Reynolds County, Mo. James Gallian is [was] heard bragging of having murdered a man on the road of whom he took horse, equipments and $80 in money; was a regular horse thief. A more exact report of the whole affair has reached you undoubtedly by this time through the mouth of the commanding officer of the detachment. Commanding Third Cavalry Missouri Volunteers. SIR: Pursuant to Special Orders, No. 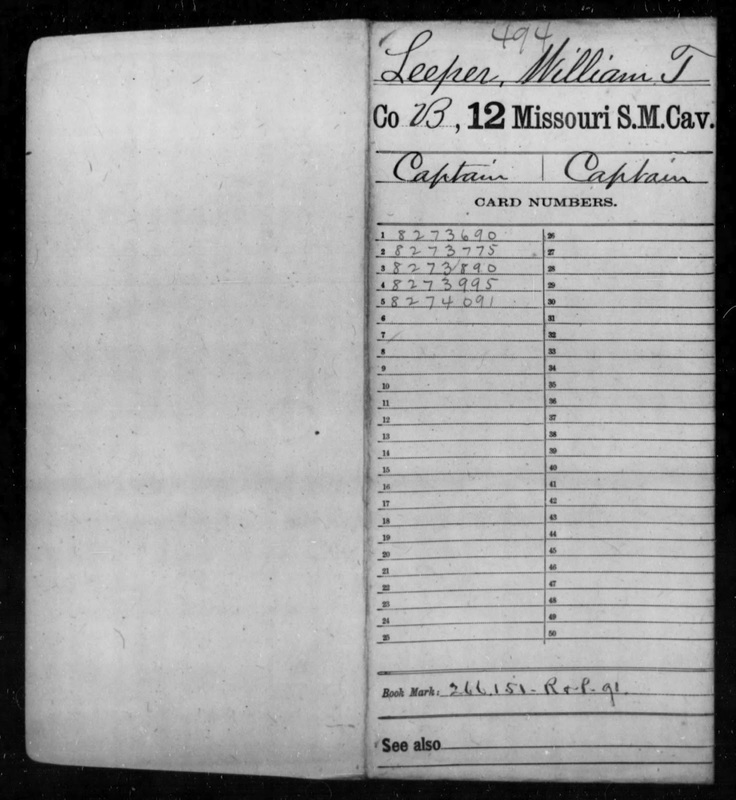 103, issued at headquarters Rolla Division, Rolla, Mo., August 28, I took command of the detachment of Third Missouri Cavalry Volunteers, composed of 105 men, and proceeded as directed in said order. On arriving at Salem, Mo, I encamped for the night. Morning August 30 having learned that there was no probability of an attack on that place I returned to these headquarters, having in charge when starting six prisoners, one contraband horse and one saddle. 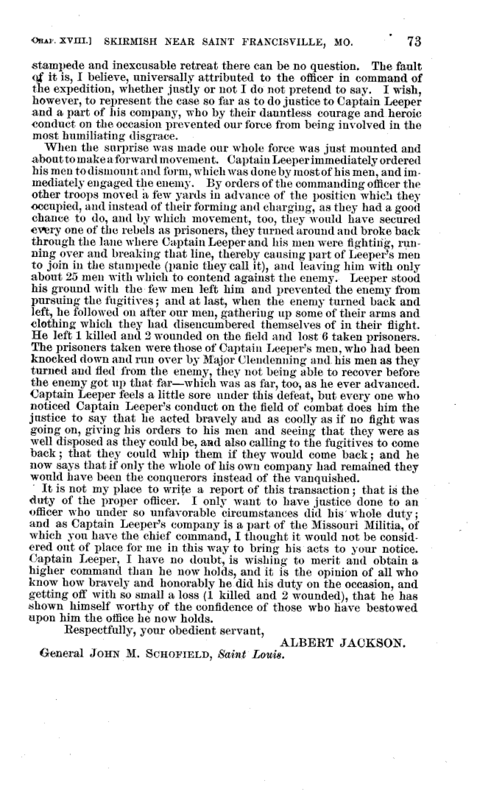 The prisoners were put into the hands of Lieutenant Lacy, who reports that they endeavored to affect their escape and in consequence thereof were all killed. The names of the prisoners are the following: Joshua Chilton, Alexander Chilton, Henry Smith, James Gallian, William Chilton, Jackson Heron. Relative to the men you sent me who have been absent down South I think they are sincere; have been greatly deceived; are ignorant and hope we can induce them to remain at home and work for us, which I have some hope they will do when we give them correct instructions as to our and the Governments purposes. They seem to have great dread they are to be shot from the examples that we have set. They say there are many who would return and be valuable friends if they can only have assurances they would not be injured in their persons. Relative to that class of men who have been deceived and induced to leave their homes who did not commit robberies or other crimes against the Union men they should receive pardon upon the condition that they act in all things for the maintenance of the Federal Government and the protection of their Union neighbors. Those who have stolen horses or committed other crimes should be held responsible. I shall have to investigate the killing of those prisoners by Lieutenant Lacy. The more I hear of it the more aggravated the case seems. I hope you will counteract every impression that seems to indicate that we murder prisoners or indulge those who do. We may make a very favorable impression upon such men as those in question who have turned the other side and have returned to us for forgiveness arid protection. In such cases let us use the opportunity. They report there are a large number in their fix who only want assurances they are not to be shot when they come in to do so and cooperate with you then and be useful. Take such precautionary steps with them as you think best, viz, put them under oaths and bonds requiring them to report at stated times, giving all the information they gather from time to time, & c. I would be indulgent to Hubbs and Nimrod Gaines. Charles H. Smith has not been out-says he has lost a horse. I would suggest that you return his horse, as he says it is in your possession or rather that of one of your captains. These people are very ignorant and we must make much allowance for them where they seem honest. The wires have just told us we had won another glorious victory on the Potomac. We have whipped them in a grand battle in Maryland near Frederick. McClellan is doing the work. J. M. GLOVER, Colonel, Commanding Division. Unidentified, but not completely unknown. The Huddleston family was quite large and was well represented in Shannon and Oregon Counties. Sam Herring is undoubtedly Samuel Herren, b. 1839 in Tennessee to Jackson Herren and Sarah Hunter-Herren. In 1858 Jackson Herren purchased property from the US Land office in sections 22 and 23, Township 31, range 3 west. According to the OR Jackson Herron was captured, at his home on Big Creek, and killed with Joshua Chilton and the others. WILLIAM CHILTON, b. 1840 son of Shadrach and Patsy Harrison Chilton, brother of Alexander Chilton. Andrew J Chilton, William and Alexander’s uncle. Alexander Chilton was probably in the MO State Guard early during the war, however we have not found the documents to prove it. We do know that he enlisted in Co I of the 4th MO Inf Vol. during the spring of 1862 and that he was captured and in Federal custody on March 28, 1862. Compiled Service Record file is included in the addendum. A “Louis” Conway was not identified. However, a Jesse Conway was living with the Chilton’s in 1860. Also, the OR identified him as Jesse Conway. Believed to be somewhere on Spring Creek probably on or near the “present day” golf course in Salem, MO. Excerpted from the field reports and edited by Robert Flanders and John F. Bradbury, Jr.
Weydemeyer was a German immigrant, a "Forty Eighter," whose participation as a socialist in the losing cause of the 1848 rebellion had forced him to flee his native land. Settling in New York City, he was active in the developing labor movement there. He was a member of the German Communist League, knew both Karl Marx and Freidrich Engels, and subscribed to their ideals. Weydemeyer was a well-educated and literate man. In New York he edited two German-language journals aimed at working class immigrants, and worked as a surveyor in the design of Central Park. Convinced that slavery undercut the cause of free labor, he became an ardent abolitionist, and adopted the (for the time) radical notion that blacks and whites should unite against the exploitation of both slave owners and industrial capitalists. He led labor opposition to the Kansan-Nebraska Act of 1854 because it tacitly permitted the expansion of slave territory; and he supported Lincoln for president in 1860. With the outbreak of war Weydemeyer volunteered to General John C. Fremont, then in New York, who was gathering a staff to take to St. Louis where he was to become Commander-in-Chief of the Department of the West, i.e., the trans-Mississippi. St. Louis with its large German population, almost all Unionist anti-slave, attracted Weydemeyer. He was appointed Captain of Artillery in Fremont's staff. When all Fremont's officers were demobilized in November, 1861, Weydemeyer was appointed Lieutenant Colonel of Missouri Volunteer Artillery. In the summer of 1862 he took command of an outpost at Houston, 54 miles south of Rolla (or, as Weydemeyer put it, "54 miles from civilization"). Shortly the post was moved to Salem, much nearer to the divisional headquarters at Rolla, and with a better road. Colonel! ...I am not provided...with the right kind of muster rolls, and therefore cannot muster again, before you take the trouble to furnish them. I need fifteen, if a staff muster roll has to be made out, although I am the only staff officer here; twelve, if no staff rolls are required from here .... The guide, I spoke of, cannot furnish his own horse, as it was taken from him by the rebels long ago. His subsistence will be furnished by secessionists and southern sympathizers, as I will keep him steady at work; we also will find always contraband horses enough in the country, not to put the Government to any expenses. Said guide did already valuable to the country by bringing information to Col. [Powell] Clayton 5th Kans[as] Cav[alry] that one of his companies was surrounded by the rebels in the valley of the Current River and thereby rescuing her. $2.- is in my opinion not too much for a faithful guide, although he cannot furnish his own horse and subsistence, and I trust you will not object to that allowence [sic] under those circumstances. Alfred Deathridge was born in Stokes Co North Carolina, the son of Lewis Deatherage. Lewis died in Kentucky and Alfred went to Morgan Co IL , after the Black Hawk War (in which he served) he left Morgan Co IL with several families and headed for Missouri. You can first pick up Alfred in Morgan Co IL on the 1830 census, then Missouri for 1840 through 1880. He is still on the Shannon Co Missouri census page 368c, widowed and living with his son. He had three wives that I am aware of Martha Keithly, Amanda Boyd and his final wife Mary that passed before him. I believe this to be in reference to returning members of the Missouri State Guard who were wanting to quit fighting and return to their homes and families rather than join the Confederacy or the Union. Ozarkwatch: Colonel! ...two men B.F. Hubbes and Nimrod Gains came in, who both reside about eight miles south of here and were scared away by stories told them in regard to the destination of the new levy, which should be sent directly to Virginia etc. They ran south to Arkansas about six weeks ago to a small place in the neighborhood of Batesville, Huckrun as they pronounce it, and returned from there Monday before last, after they had been convinced that they would be impressed the service there as well as here. Yours of 20 inst. was duly received. I went to see Mr. Davidson yesterday, but did not find him at home. I saw Mr. Howell, he says that John B. Wadlow is a bad man and he has my confidence in him. I have seen Mr. Spellby Daniels, he says that John B. Wadlow volunteered in the Rebel Army at the time of Prices raid last fall and that he was about home in the company one John Dickey, a guerrilla. Mr. Daniels says that Wadlow and Dickey stole a mule, the property of John N. Copeland of D Co. 3rd M.S.M. about Oct. 1, 1864 and came to Daniels to kill him about the same time. Wadlow is reported by Capt. Leeper as a guerrilla. I think Mr. Daniels would be a good witness against Mr. Wadlow. Daniels can be found here when wanted. 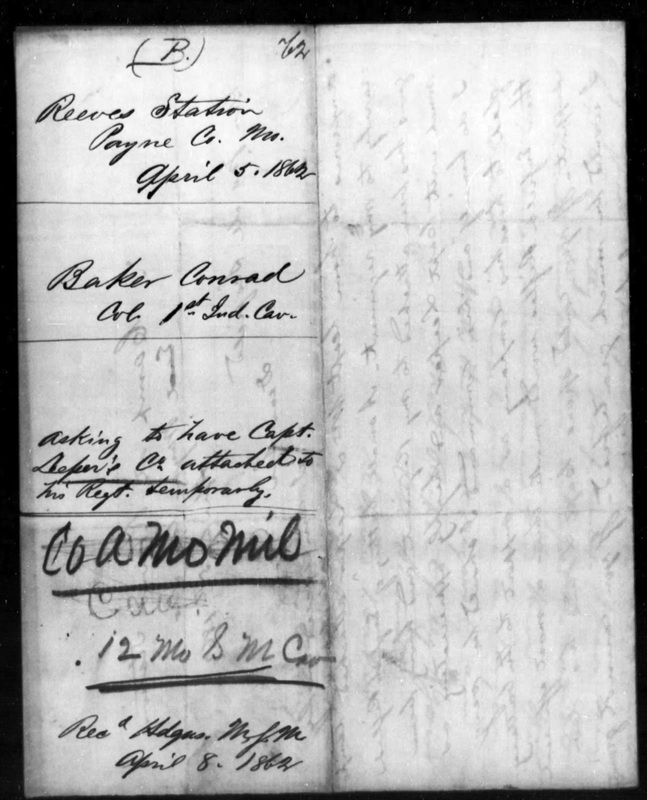 Compiled Service Records, Wadlow, Charles C and John B Wadlow, Quantrill’s Reg. file, footnote.com. I have the honor to enclose the statement of persons whom John B. and Charles C. Wadlow gave as references to their loyalty. They are all loyal men. 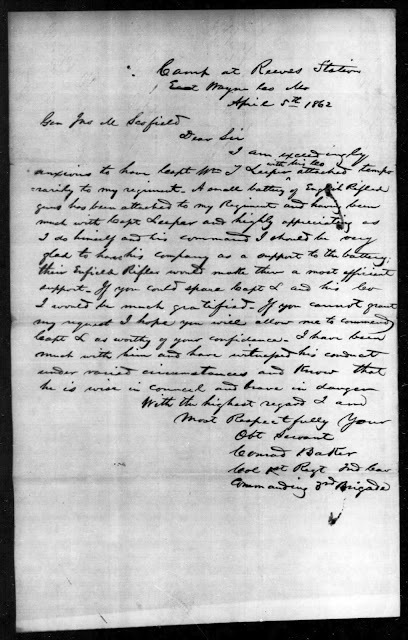 I sent up the prisoners own statements at the time I sent them to St. Louis and I supposed their own statements with the letter in the case was sufficient evidence of their disloyalty. I think this evidence of their Rebel sympathies will be sufficient to warrant their exchange as Rebel soldiers. The Rebs swore me into the service. Statement of John B. Wadlow a citizen of Reynolds Co. MO. I was taken from home about the last of Sept. 1864 by the Rebel Col. Douglas’s then to the house Jim Smith about a half mile from my house. The Rebs swore me into the service. And ordered to report to Lesterville the next day (4 miles). I reported and Col. D. told me to come again in 2 or three days which I did. I went off with Col. Pollack south. It was five or six days from when I was first taken or conscripted until I left with Col. Pollack. When we left with Pollack, we went to Current River and from there went down to Eleven Point River and struck the Mississippi River at Malones, nine miles above Memphis on the Arkansas side. We stopped at Malones about six weeks and left there on account of the soldiers at Memphis who ran us off. We then went 15 miles below Memphis where I left them on the 18th of January, and got home about the 1st of February 1865 and came into Pilot Knob and gave ourselves up on the 11th to the Pro. Mar. Subscribed before me this 19th day of March, 1865 at Pilot Knob, MO. They were on their way to Jim Buford’s (Rebel) Co.
Marion Johnson, a citizen of Iron Co. he being of lawful age, deposeth and sayeth. I am well acquainted with John B. and Charles C. Wadlow, who are now confined in military prison in St. Louis. I don’t consider them loyal men. After the Rebels had made the raid, I returned to my home in Reynolds Co. The two Wadlows with several others well armed came to my house. All appeared to be on equal footing. They were on their way to Jim Buford’s (Rebel) Co. near Centerville, MO. I think they could have gotten away at any time that they wished to. It is the general understanding in that neighbor that they went voluntarily into the Rebel army. Subscribed before me this 23rd day of March, 1865 at Pilot Knob, MO. Care must be taken to follow carefully all the requirements of that order. Col. Pollack, of the Rebel Army and two others (Rebels) came to Mr. Wilson’s house in Reynolds Co. and as I was passing the house they met me in the road and swore me in and ordered me to report in Centerville in two days. That is six miles from where I was conscripted. I reported there and we organized and then I was furloughed six days. And met again at Centerville and marched for Current River where I met with my brother John B. Wadlow. The rest of my statement is like his, as we were together the rest of the time. Subscribed before me this 10th day of March, 1865 at Pilot Knob, MO. Office of Pro. Mar. Gen’l. There is now in custody here one Charles C. Wadlow, who claims to have been conscripted and refers to the following as his loyalty. Thomas Faulkenberry, William Copeland, Marion Johnson, and John Davidson all of Ironton, Iron Co., MO. There statements you will take at once, if you know anything as to the loyalty of these parties, you will so report. If their loyalty is doubtful, you will take the statement of the two most reliable Union men acquainted with their character and forward the same to this office. You will obtain this information with delay. A. Pro. Mar. Col. Pro. Mar. Genl. Is this an oath of allegiance? Lieut. Wadlow expressed a desire “take an oath, not again to take up arms against the U.S. Govt.”. March 14th /65 Is this an oath of allegiance? Yours of 20 inst. Was duly received. I went to see Mr. Davidson yesterday, but did not find him at home. I saw Mr. Powell, he says that John B. Wadlow is a bad man and he has my confidence in him. I have seen Mr. Shelby Daniels, he says that John B. Wadlow volunteered in the Rebel Army at the time of Prices raid last fall and that he was about home in the company one John Dickey, a guerilla. Mr. Daniels says that Wadlow and Dickey stole a mule, the property of John N. Copeland of D Co. 3rd M.S.M. about Oct. 1, 1864 and came to Daniels to kill him about the same time. Wadlow is reported by Capt. Leper as a guerilla. I think Mr. Daniels would be a good witness against Mr. Wadlow. Daniels came be found here when wanted. In my opinion is that the boys is like the father. That I am acquainted with Charles C. and John B. Wadlow, of Reynolds Co. MO and now in the mil. Prison in St Louis MO. I never heard of either of them being in the Rebel Army until they went off with Price Oct last. I have not heard much about the boys, either one way or the other, but their father is a Rebel sympathizer. In my opinion is that the boys is like the father. Subscribed before me this 24th day of March, 1865 at Pilot Knob, MO. Sgt. Jonathan Jordan 1831-1900, the brother-in-laws.